China’s cross-border e-commerce reached 6.7 trillion RMB ($1 trillion) in 2016, a compound annual growth of 31.6%, said a report issued at a cross-border e-commerce forum held on Oct. 29 in Shanghai. According to the report, people born between 1980 and 1990 made 59% of the overseas orders in 2016, followed by the post-90s and post-70s generations who respectively placed 23.0% and 14.4% of the total orders. Online shoppers who buy products from overseas are generally older than the average online consumers with higher academic degrees and income. In addition, most of them have stable marriages and jobs and more purchasing power. Cosmetics and infant supplies were the most popular overseas products for Chinese online shoppers, since young people and new parents formed the majority of this group. As many as 11.9%, 11.1%, and 3.8% of the population in Beijing, Shanghai, and Hangzhou have placed orders from overseas in the past year, and the three cities topped the country in terms of this proportion. With implementation of the Internet+ strategy, cross-border e-commerce has kept an annual growth rate of 20-30% since 2015. The volume of the sector is expected to hit 8.8 trillion RMB in 2018. Chinese genomics institute BGI Research on Oct. 26 announced that it has launched an institute of synthetic biology with George Church, a professor of genetics at Harvard Medical School. 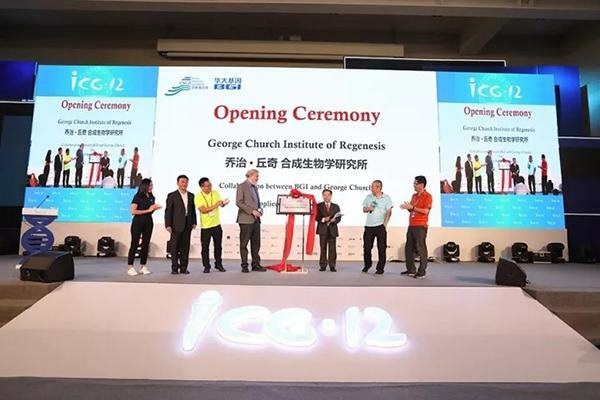 The George Church Institute of Regenesis, which will be established on the synthesis and editing platform of the China National Genebank, plans to focus its studies on three major cutting-edge fields, including high-density DNA storage, bio-manufacturing of natural materials, and medical genome editing. George Church will be the chief scientist of the institute that bears his name. Yang Huanming, BGI chairman and academician at the Chinese Academy of Sciences, told Xinhua News Agency that Church has made a strong commitment to support the research of BGI, especially in the area of synthetic organisms. “We are actively exploring for the innovative application of synthetic organisms in the fields of precision-medicine, in-vivo detection, and proteomics detection and treatment,” said Church, who has been a longtime advisor to BGI. Xu Xun, director of BGI Research, believes that the rewriting of genes will be another major task of biosynthesis, following genetic sequencing, and the institute will be committed to the development of this technology. Church is the director of a personal genome project at Harvard Medical School and he published the first direct genomic sequencing method in 1984. He was nominated for the Nobel Prize in Chemistry last year. Five years ago, a group of people established a power supply bureau for Sansha city’s Yongxing Island in South China’s Hainan Province to provide electricity on the island. Feng Naihua, 35, deputy director of the bureau, has stayed on the island for more than 900 days since arriving on the island in August 2013. He spent several Spring Festivals with people on the island. With efforts from people like Feng, electrical supply has changed the island a lot. In the past, few fishermen were willing to live on Yongxing Island, but following improvements on the island, more fishermen moved to the island. The island’s stable power supply has led to the establishment of restaurants and seafood stores. 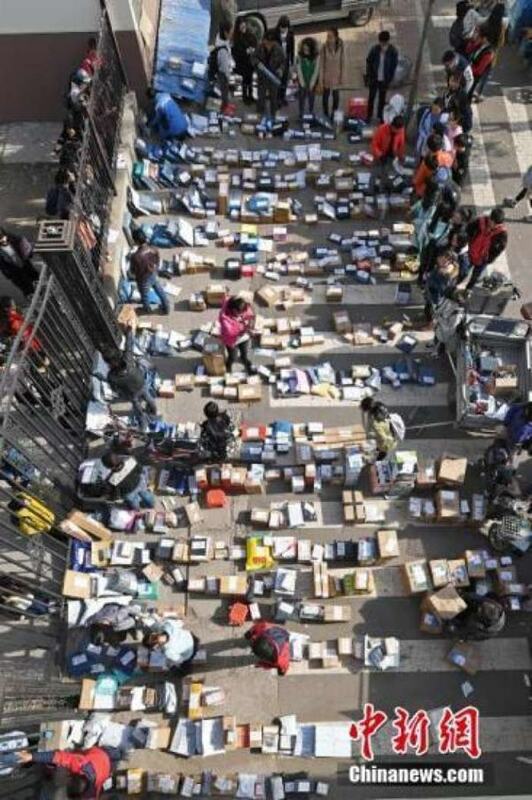 Internet access on the island has stabilized as well, which has allowed the stores to accept mobile payment applications Alipay and WeChat Pay, and even provide delivery services. From three to four power outages a day to stable power supply; from not being able to use a rice cooker to having a huge cold storage; from using unclean underground water to having a desalination station; from poor quality television reception to a movie theater on the island, the people who live in Sansha are experiencing huge changes in the South China Sea. This year marks the fifth anniversary of the founding of Sansha. 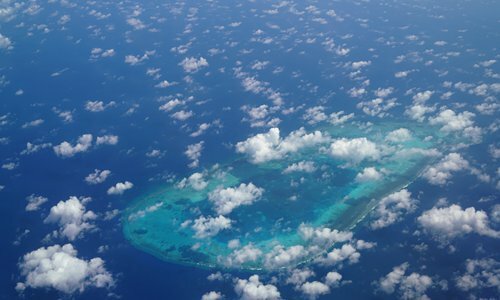 Officially set up on July 24, 2012 on Yongxing island, the prefecture-level city administers the Xisha, Zhongsha and Nansha Islands and their surrounding waters in the South China Sea. Buyers are queuing up for Apple Inc’s iPhone X with preorder sales in China beating expectations since they began on Friday afternoon, and experts said the new device will push domestic smartphone manufacturers to increase their technological level and prices. “It took only five seconds for the first iPhone X batch to be sold out,” Pan Zhiyong, general manager of the mobile phone unit of T-mall, Alibaba’s e-commerce marketplace, said on his Sina Weibo account on Friday. T-mall has communicated with Apple Inc regarding inventory, to get ready for the upcoming Singles’ Day shopping spree on November 11, he said. 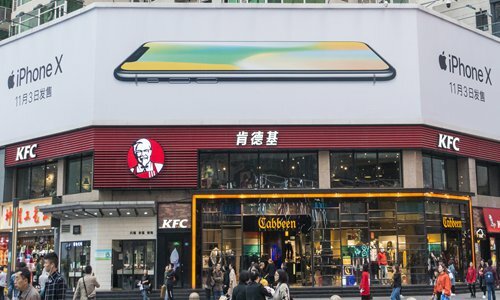 Consumers can also book an iPhone X, which marks the 10th anniversary of the launch of the original iPhone, on the websites of domestic telecommunications operators and e-commerce platforms such as JD.com. As of press time, 2,321,703 customers had placed preorders with JD.com. “As a die-hard fan of Apple’s products, the revolutionary iPhone X is a must-buy product, given the anniversary factor and its high-tech and appealing appearance, despite the high price,” a female white-collar worker surnamed Bai told the Global Times on Sunday in an Apple store in Joy City, Beijing’s Chaoyang district. The 64 GB version costs 8,388 yuan ($1,261.39) while the 256 GB version costs 9,688 yuan, a record high for an iPhone product. “I booked a 256 GB iPhone X yesterday. Many people around me have also placed preorders,” Bai said. However, some consumers are more cautious. Li, a businessman who was also browsing at the Joy City Apple store, told the Global Times that he was considering buying an iPhone X but has chosen not to for the moment, because the product is not yet in the shops and he wanted to see it first before paying such a large amount of money. “Besides, there are so many competing smartphone models in the market. I have considered buying the newly launched Huawei Mate 10 Porsche Design… For businessmen, it’s convenient to use Huawei’s phone as it can carry two SIM cards, and there’s no need to have two phones,” Li said. The luxury Mate 10 Porsche Design, launched by Chinese telecommunications giant Huawei in Germany on October 16, is priced at 8,999 yuan in China and will go on sale in the middle of November. Sun Yanbiao, head of Shenzhen-based research company N1mobile, told the Global Times on Sunday that customers’ disappointment with the iPhone 8 has doubled their expectations for the iPhone X, naturally leading to the surge in preorders. Compared with the iPhone 7, the recently launched iPhone 8 doesn’t offer any big progress, but the iPhone X is a more daring step forward in technology, with such key selling features as a full-screen OLED display, facial recognition technology and a better camera, said Liu Dingding, a Beijing-based independent Internet analyst. The iPhone X might kick off a totally new iPhone product line aimed at the higher-end market, which is why the pricing is different from previous products, Liu noted. Future sales of the iPhone X will gradually stabilize and the total sales will not surpass those of the iPhone 6s, Sun forecast. The cutting-edge high-tech product will inspire domestic smartphone vendors to upgrade their technology, and at the same time raise prices to ensure profits, experts noted. Domestic brands Huawei, Xiaomi and Vivo have also released products with full-display screens. In face of the fierce competition between smartphone vendors both at home and abroad, “they tend to pursue personalized design in the phone’s appearance such as providing various colors and making changes to the screen, including offering an edge-to-edge display,” Sun said. In terms of the supply chain, Sun said domestic vendors can reach Apple’s standard within three months, and he forecast that Huawei’s P11 series, reportedly set to be launched early next year, will catch up with or even surpass the iPhone X in some areas of its technology. Taiwan leader Tsai Ing-wen arrived in Hawaii Saturday en route to three Pacific island nations that Taiwan has official relations with – the Marshall Islands, Tuvalu and the Solomon Islands. Tsai’s transit via US territory to the islands is a focus of attention of her visit. Most Taiwan “allies” are in Central America and the South Pacific. Transiting via the US to these small states is a trick that the Taiwan administration has long been fond of playing. Whether to allow the Taiwan leader’s transit and the level of reception has become a way for Washington to express its attitude to the Taiwan administration over time. Generally speaking, Washington receives the Taiwan leader with a higher level than before. Tsai transits via Hawaii and Guam to and from the islands this time, and meanwhile some of her unofficial activities have received medium-level treatments. On the one hand, Taiwan is left with only 20 “allies” and the population of the largest one is less than Taiwan’s. The US federal government only recognizes Tsai’s private identity during her transit. This is a deplorable situation for the Taiwan administration. But on the other, both Taiwan and the US have sneaking calculations over the transit. Although carrying little weight in the overall Asia-Pacific pattern, these little tricks may create disturbances some day if no notice is taken of them. Therefore, the Chinese mainland should lodge representations with the US over Tsai’s transit, and meanwhile warn Tsai to behave herself, exerting the necessary pressure on both sides. In the meantime, we should be confident that Taiwan has been left with little “diplomatic” space and that it is hard for the Tsai administration to make waves. With the rise of the mainland, the one-China policy is increasingly embedded into today’s world order. This is an irreversible trend. The Taiwan administration can only express its resistant sentiments by verbal provocations or by playing the angles. Meanwhile, the US is willing to have such exchanges with Taiwan in its competition with the mainland. This is the essence of Tsai’s transit via the US. The mainland has the capability to control the overall cross-Straits relationship. 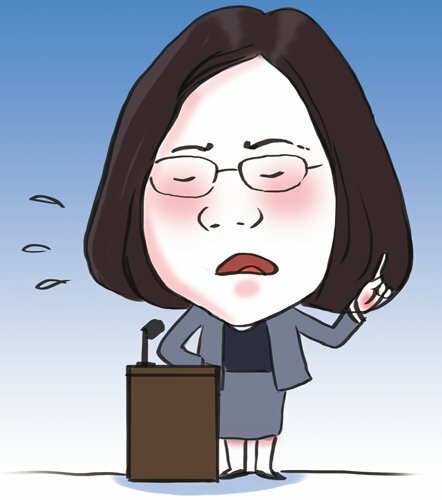 Obviously, Tsai is much more prudent than her predecessor Chen Shui-bian, but the Taiwan administration will still get up to petty actions for a certain period of time. The mainland may have to teach the provocative Taiwan some lessons from time to time, and take retaliatory measures against the US correspondingly. The mainland will for sure become more dominant in this game. Actions should be taken to prevent the US and Taiwan from radical tricks that may be played to balance Taiwan’s shrinking “diplomatic” space and Washington’s declining bargaining chips toward the mainland. The US House Foreign Affairs Committee passed the Taiwan Travel Act this month in an attempt to raise the level of exchanges between the US and Taiwan. There’s still a long way before the bill can be approved into a law, but it reflects Washington’s dissimulation of its weakening strategic advantages over Beijing. Li relocated to India in March of this year to start a Master’s degree program there. Over the months, in addition to her studies, she has had to juggle adapting to the local culture, language and environment while ensuring enough time for daily communication with her family and young children back in China. All of that she can handle quite capably, but the one thing that continues to keep knocking her down is the status of her visa. 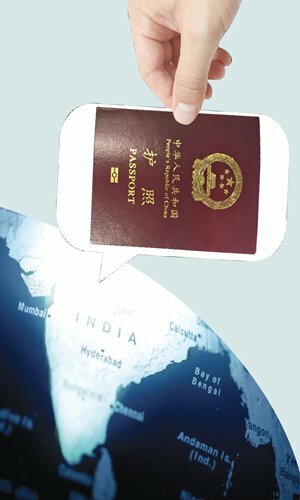 “It became much harder for Chinese to get a visa extension in India right after the border standoff in June,” said Li, who wants to disguise her identity for safety concerns. She first applied for the visa in April, however, when she applied later in the year for another extension, what she got instead was an indefinite delay. Visas for Chinese students in India have become a hot topic in recent months following the Doklam standoff in June. India removed its trespassing troops from the Chinese territory of Doklam in late August. According to the former president of the Chinese Student Union in India, surnamed Wu, Li’s situation is now quite common. “Most Chinese students’ visa applications have been ‘pending’ since the border tension. 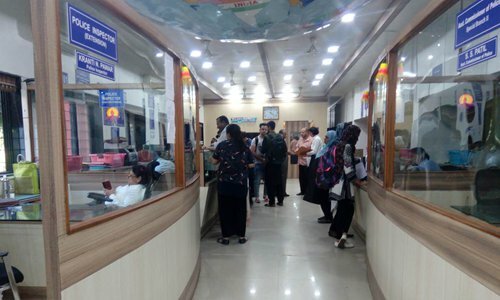 Obtaining and renewing visas has always been a challenge for Chinese students in India, but things became much harder recently,” said Wu, adding that he believes India’s Ministry of Home Affairs is responsible for the delays. There are over 100 Chinese students currently in India, with a majority living in the cities of New Delhi, Ahmedabad, Pune, Mumbai and Bangalore, according to Wu. Based on current procedures, students from the Chinese mainland may only apply for a three-month visa to India before they leave China. Once there, they must renew their visa if they want to continue their studies. Even local visa service agents and companies, which charge high service fees, are not willing to take Chinese clients as it is “too hard for a Chinese to get visa,” said Li. Li and other Chinese students like her face the single-most bureaucratically complex aspect of expat life in India. Without a valid visa, they cannot continue renting apartments, they cannot travel or even book a hotel – all things that “undocumented foreigners” in India are prohibited from doing. Likewise, CoCo, a 20-something Chinese student, arrived in India enthusiastic about immersing herself in the culture and beginning school there, but has gradually become disenchanted by India’s notorious red tape. “It was really a distressing process and I was surprised by their irresponsibility and inefficiency,” said CoCo, who applied for an extended stay months before starting her Master’s program, following a four-month language course. “I was really in a rush to get my visa renewed, so that I could continue enrolling in other courses at my school, but they always told me to come back in 10 days, then another 10 days after that, over and over again,” she said. According to CoCo, in China it only takes two or three days to get an Indian visa, presenting a sharp contrast to how administrative work is handled in India. In order to continue her Master’s program, Coco had to fly back to China to apply for a new visa. However, getting her exit permit was yet another headache. CoCo often had to go to the local FRRO in person to push them about her application, otherwise the staff members there simply would not even look at it. The FRRO officers also provided inconsistent and often incorrect advice, each contradicting the other, which further delayed the process. Coco claimed that Chinese students must bribe FRRO personnel with cash if they want their application to be dealt with quickly. Her experience was echoed by many other Chinese students contacted by the Global Times. “I waited all summer vacation, but only received my exit permit right after my course began. It influenced my studies badly,” CoCo said. She added that on the day she went to the office to pick up her papers, she was forced to wait there for eight hours. “I came to India to study, not skip classes every single day to apply for a visa,” she said. Indeed, returning home has become a luxury for Chinese students in India, including Bai Haoyue (pseudonym), who is studying on a one-year program in India. With a valid visa, Bai was able to fly to China for a family reunion in April and return to India. However, in August a family emergency came up and she rushed to the local airport, where she was physically forbidden from departing by Indian immigration officials. “The airport staff said I could not leave India because I didn’t have a registration document from the police. But days later, FRRO told me that I didn’t need such a document to leave,” Bai said. “It worries me that we cannot go back home even if there is an emergency. I feel we have lost our freedom,” Li said. She has heard several similar examples where Chinese students’ family members were sick or hospitalized but they were not allowed to return to help. For most Chinese students coming from the Chinese mainland, a new visa is now required each and every time they wish to return to India. “The FRRO staff in Mumbai know me well, so you can tell how many times I have been there,” said Xu Yan (pseudonym), a college student who is afraid of revealing her real name for safety reasons. Xu added that she feels like she is “being monitored” in India, as she must report to the local authority each time she returns. As for a return visa, some cities have also changed the way they issue the document. For example, prior to the border standoff, a return visa could be issued locally in Pune, but now all documents must be sent to New Delhi for approval, according to Li. “I think it reflects that the Modi government is reviewing Sino-India relations after the Doklam standoff, which has inevitably influenced diplomatic services, such as passports and visa services,” said Song Dexing, director of Center for Strategic and International Studies in Nanjing Institution of International Relations. Song predicts that New Delhi will further put constrains on cultural, education and economic exchanges in order to display their “tough attitude” as a powerful state. His analysis echoes Wu’s observations, who found that Chinese businessmen in India are also facing visa complications. Many of his friends there have had their business visas rejected recently or have been instructed to attend a face-to-face interview during the application process, which rarely happened before the border standoff. “I have asked my Indian friends working in China if they felt any tension here following the Doklam standoff, but none had. In contrast, those Chinese in India can really feel its negative influence,” said Wu. “Visa issues have always been a problem deterring the development of bilateral relations between China and India, not just a direct result of the recent border standoff,” said Lin Minwang, a professor at Institute of International Studies, Fudan University. Lin explained that India’s Ministry of Home Affairs is, comparatively speaking, considered “not that friendly” toward Chinese applicants. 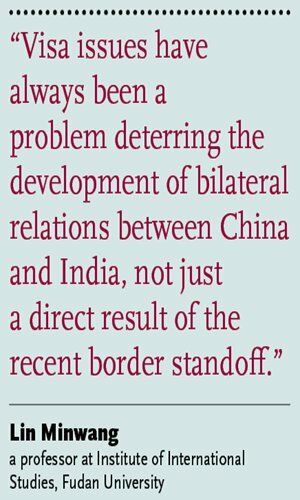 Lin believes that the India-China border standoff will be “a turning point” for the relationship between the two countries, but said it is hard to say which direction it will go. As to the recent appointment of a new Indian ambassador to China, Gautam H. Bambawale, Lin said this does not guarantee softer diplomacy. According to those Chinese students in India contacted by the Global Times, their enthusiasm for India is quickly eroding. Many said that they will simply quit their study plans in India if their visa extensions are rejected again, even if they already paid their full tuition fee. The Global Times contacted India’s Ministry of Home Affairs, the Foreigners Regional Registration Office in New Delhi, the India Visa Support Center and the Indian Embassy in Beijing repeatedly for comment, but did not receive a single response. China will reform its disciplinary organs and strengthen anti-corruption efforts in accordance with the 19th CPC National Congress report, China’s top anti-graft watchdog announced in Beijing on Thursday. China will carry out pilot supervisory reform programs throughout the country and a new supervisory law will grant the supervisory commission legal authority to investigate corruption, according to the Communist Party of China (CPC) Central Commission for Discipline Inspection (CCDI). 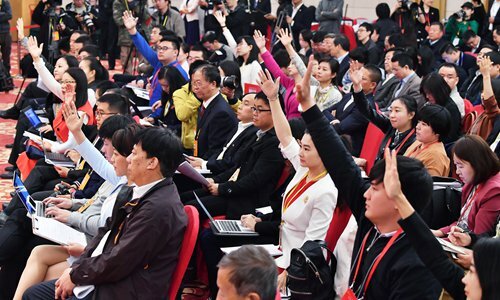 Supervisory reform will be deepened and pilot programs quickly carried out across the country according to the arrangements of the 19th CPC National Congress, said Xiao Pei, CCDI deputy secretary, at the conference for interpreting the congress report. China has already set up pilot supervisory commissions in Beijing as well as Shanxi and Zhejiang provinces by integrating their governments’ supervision departments, corruption prevention bureaus and divisions which handle bribery, dereliction of duty and prevention of duty-related crimes under the People’s Procuratorate. The reform aims to form a more centralized, authoritative and efficient supervisory system. Xiao said a national supervision law will be formulated so that supervisory commissions will be given responsibilities, powers and the means to investigate in accordance with the law. “China would build a ‘rule of law’ system. The concept also needs to be reflected in anti-graft work,” Li Yongzhong, former deputy director of the China Discipline Inspection and Supervision Institute, told the Global Times on Thursday. In the past, the Party’s discipline watchdog used “shuanggui” to detain suspects. Shuanggui is an intra-party disciplinary practice that requires a Party member to cooperate during questioning at a designated place and time. About one-eighth of the 19th CPC National Congress report, delivered by Xi on October 18, was about Party self-discipline. Shuanggui will be replaced by detention, Xi said in the report. The national supervision commission is not a judicial organ, CPC CCDI Deputy Secretary Xiao explained. Work-related crimes involving anti-graft work is no ordinary criminal offense, he said. “The national supervision law will specify the approval procedures, when they should be used, the time frame of relevant measures, as well as the safety of investigations and medical treatment. This will further legalize the anti-graft work,” Xiao said. Five other officials also attended the Thursday press conference to interpret the 19th CPC National Congress report. Jiang Jinquan, an official from the State-owned Assets Supervision and Administration Commission, said the report for the first time included political construction in the overall Party building plan. Political construction must lead the way, Jiang believed. The first mission of Party political construction was to “uphold the Party’s central authority and its centralized and unified leadership,” he said. 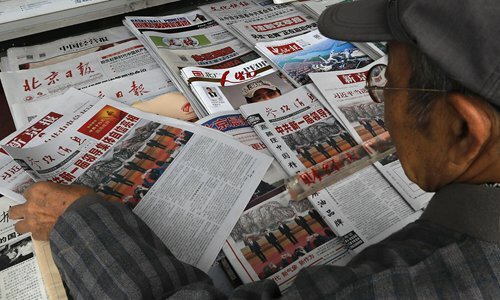 To stress political construction was “to ensure that the Central Committee’s decrees and directives are faithfully carried out without disruption,” Cai Zhiqiang, a professor at the Party School of the CPC Central Committee in Beijing, told the Global Times on Thursday. “Some believe that in a market economy, the Party’s governance can be subdued. This is extremely wrong,” he said. China’s focus has shifted to higher-quality growth and will no longer target doubling the country’s GDP in its two-stage development plan from 2020-2050, a senior official said on Thursday. 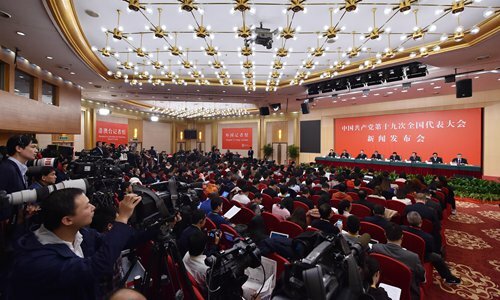 “The main consideration is that the major contradiction facing Chinese society has changed as the country’s economic development has shifted from high-speed growth to a higher-quality development stage,” Yang Weimin, deputy director of the Office of the Central Leading Group on Financial and Economic Affairs, told a press conference following the conclusion of the 19th National Congress of the Communist Party of China (CPC). The most prominent problem facing the country is not inadequate industrial capacity, but that the quality of economic growth is not good enough, Yang said. But he denied that the country has abandoned growth rates. The conspicuous break from past practices, Yang said, was taken by the Party Congress out of consideration to better implement the new vision for development. In the first stage from 2020 to 2035, the CPC will build on the foundation created by the moderately prosperous society with a further 15 years of hard work to see that socialist modernization is basically realized. In the second stage from 2035 to the middle of the 21st century, the CPC will, building on having basically achieved modernization, work hard for a further 15 years and develop China into a great modern socialist country that is prosperous, strong, democratic, culturally advanced, harmonious and beautiful. Yang said that the vision shows that the economy will achieve socialist modernization 15 years ahead of schedule. 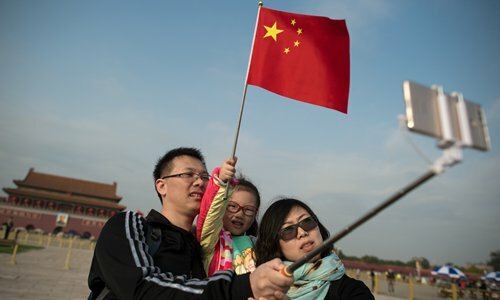 “Modernization would be more multifaceted than just GDP growth, incorporating greater concern for social well-being, regional balance, national security and political cohesion, but done in a uniquely China way,” Yukon Huang, a senior fellow at the Carnegie Endowment for International Peace and a former World Bank country director for China, told the Global Times. Overall, optimism prevails for the dividends the world’s second-largest economy will receive from the key gathering held every five years. China’s economic policy will be more mature and steadier, not only more in line with the national conditions but will address the people’s key concerns and will focus on their well-being, Liu Zhiqin, a senior fellow at Renmin University of China’s Chongyang Institute for Financial Studies, told the Global Times. “There won’t be dramatic fluctuations in economic growth in the coming periods,” Liu said, adding the financial sector remains the only uncertainty. Analysts believe that China will face challenges from the financial sector in the coming decade, with the key issues to include how China will further open up its capital market. The international community also places high hopes on China to further liberalize its capital market, Liu said. But China has the confidence and ability to push ahead with financial reforms to further open up the capital market, as reflected by the country’s latest transaction of dollar-denominated sovereign bonds in Hong Kong, he added. The Ministry of Finance has announced plans to issue US dollar-denominated sovereign bonds worth $2 billion in Hong Kong and has begun discussions with potential investors to further open up the country’s financial sector. “Thus far, Beijing has been pushing for the ‘soft’ reform option in the form of diversifying SOE ownership. What is now needed is more clarity in sectors where there is no strong justification for continued State involvement while preserving or even enhancing the role of the State in other areas,” he said. China will continue to implement preferential policies affecting the people’s livelihood, especially on education in underdeveloped areas, senior officials said on Sunday. China has made progress in employment, housing, education and its social security system since 2012, especially for underdeveloped areas, officials from the ministries of civil affairs, education and other relevant departments told a press conference at the 19th National Congress of the Communist Party of China (CPC) on Sunday. In the area of employment, Human Resources and Social Security Minister Yin Weimin said, “We’ve helped 8.8 million people in strained circumstances find jobs,” then adding that the total number of rural migrant workers increased from 263 million in 2012 to 282 million in 2016. Yin said the registered unemployment rate in Chinese cities stood at 3.95 percent at the end of September, the lowest in years. “The number of counties with subsistence standards lower than the national level has been cut from 1,521 in 2015 to 72 … and the basic standard of living of nearly 60 million people with subsistence allowances in urban and rural areas and special difficulties have been basically guaranteed,” said Huang Shuxian, Minister of Civil Affairs. Other officials said that preferential policies in rural areas would carry on into the future to support local development. “To repair the unbalanced, inadequate development of medicine in remote areas, we plan to begin cooperating between regions with much better medical resources and to enhance the quality of public health services,” said Li Bin, Minister of the National Health and Family Planning Commission. “All of these moves accord with the shift in the contradictions in Chinese society and will help solve the income gap problem between different social classes as well as regional gaps,” Hu Xingdou, a professor at the Beijing Institute of Technology, told the Global Times on Sunday. “Placing more importance on balanced development would help promote fairness and justice in society and would confirm the CPC’s promise to enhance people’s sense of fulfillment,” Hu concluded. At Sunday’s press conference, officials also singled out policies for helping children left behind in rural regions by parents going elsewhere to work, emphasizing education in remote areas. Chen also said that China has improved basic school conditions for a better compulsory education in poor rural areas, benefitting nearly 220,000 schools in at least 2,600 counties. In the area of child protection, a caring and protecting mechanism was improved for those rural left-behind children, Minister of Civil Affairs Huang Shuxian said, noting that it includes a special “joint custody and accompanied growth” method and pilot projects for the protection of minors. Both Chen and Huang said on Sunday that there are more policies on helping child development in remote areas coming in conformity with the 19th CPC National Congress report.